This issue covers the period of mid-March to mid-July 2017, the third trimester of Nepali Fiscal Year 2073/74 (the Nepali months of Chaitra, Baisakh, Jestha, and Asadh). It is based on the outcomes of NeKSAP District Food Security Network (DFSN) meetings held in 74 of 75 districts in July 2017. General factors affecting food security during this reporting period (between March and July) include the post-harvest period of winter crops (wheat, barley, and potato), the planting of summer crops (paddy and maize), and monsoon induced road blockades and associated supply chain offsets in some mountain districts of the country. This issue covers the period of mid-November 2016 to mid-March 2017, the second trimester of Nepali Fiscal Year 2073/74 (the Nepali months of Mangsir, Paush, Magh, and Falgun). It is based on the outcomes of NeKSAP District Food Security Net-work (DFSN) meetings held in 74 of 75 districts in March 2017. This issue covers the period of mid-July to mid-November 2016, the first trimester of Nepali Fiscal Year 2073/74. This bulletin is based on the outcomes of NeKSAP district food security network (DFSN) meetings held in 74 of 75 districts in November-December 2016 and validated in five regional review meetings in December 2016. This issue covers the period of mid-March to mid-July 2016, the third trimester of Nepali Fiscal Year 2072/73. This bulletin is based on the outcomes of NeKSAP district food security network (DFSN) meetings held in 74 of 75 districts in July-August 2016 and validated in five regional review meetings in August 2016. The Nepali version of this publication will be released separately. This issue covers the period of mid-November 2015 to mid-March 2016, the second trimester of Nepalese Fiscal Year 2072/73. 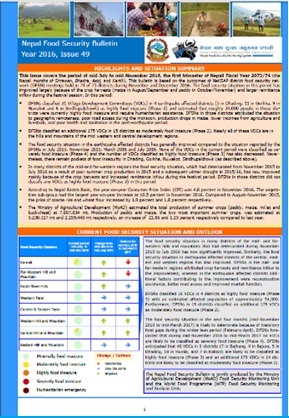 This bulletin is based on the outcomes of NeKSAP district food security network (DFSN) meetings held in 74 of 75 districts in February-March 2016 and validated in five regional debriefing meetings in April 2016. This issue covers the period of mid-July to mid-November 2015, the first trimester of Nepalese Fiscal Year 2072/73. The Nepali version of this publication will be released separately. 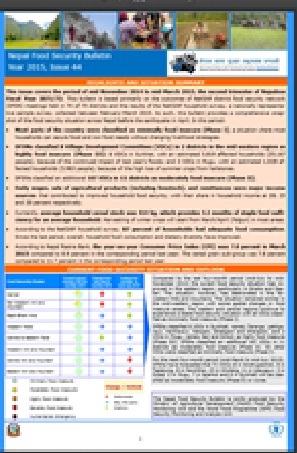 This bulletin is based on the outcomes of NeKSAP district food security network (DFSN) meetings held in 70 of 75 districts in November 2015 and validated in five regional debriefing meetings in December 2015. During this period the country experienced significant disruptions to cross-border trade with India, political unrest in the eastern Terai, a decrease in summer crop production, and continued earthquake impacts on food security and livelihoods. Due to the Terai unrest, DFSN meetings were not held in Dhanusa, Mahottari, Sarlahi and Rautahat. In addition, the results of subsequent ad hoc DFSN meetings held in January 2016 in 13 earthquake-affected districts are also included as a supplement to Issue 46. These ad hoc DFSN meetings were held in order to provide an update on the food security situation during the winter lean season period. This issue covers the period of mid-March to mid-July 2015, the third trimester of Nepalese Fiscal Year 2071/72. This bulletin is based on the outcomes of NeKSAP district food security network (DFSN) meetings held in 74 of 75 istricts during July 2015. During this period Nepal experienced a major earthquake on 25 April and a series of aftershocks which significantly affected livelihoods and food security. 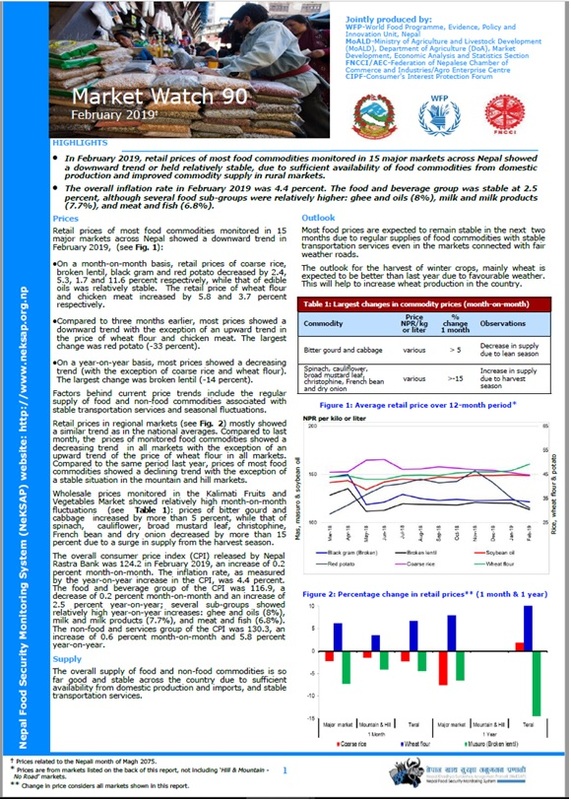 This bulletin captures the impact of the earthquake, changes between May and July, seasonal changes associated with the monsoon and other events that affected food security. This issue covers the period of mid-March to mid-July 2014, the third trimester of Nepalese Fiscal Year 2070/71. Thisbulletin is based primarily on the outcomes of NeKSAP district food security network (DFSN) meetings held in 72 of 75 districts and the results of the NeKSAP household survey, a nationally representative sample survey, collected between June-July 2014. This issue covers the period of mid-July to mid-November 2013, the first trimester of Nepalese Fiscal Year 2070/71. 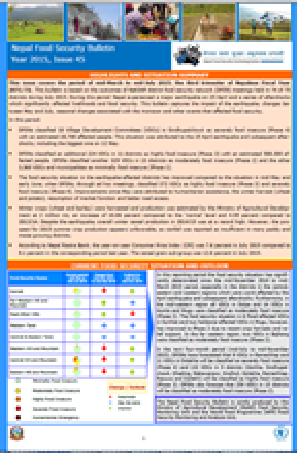 This bulletin is based primarily on the outcomes of NeKSAP district food security network (DFSN) meetings held in 72 of 75 districts and the results of the NeKSAP household survey, a nationally representative sample survey, collected between July-October 2013. The Nepal Food Security Monitoring System (NeKSAP) District Food Security Networks (DFSNs) classified 11 Village Develop-ment Committees (VDCs) in Dailekh and Darchula districts as Phase 3 highly food insecure (or crisis). In Dailekh the primary reasons for the high level of food insecurity include the loss of roughly 80 percent of the main winter crop (wheat) as a result of hailstorms and a decrease in income from the sale of agricultural products by 40-60 percent, while in Darchula, flooding led to the current situation. Overall, an estimated 37,130 people are affected. Reported coping strategies include selling of livestock and assets and skipping meals; out-migration has increased by 20-40 percent in Dailekh. Furthermore, DFSNs in 12 districts have classified 147 VDCs as Phase 2 moderately food insecure (or stressed) in this period. This issue covers the period January to March 2013, and focuses more on the food security situation updates of the Mid and the Far Western Hill and Mountain districts. January-March is an agricultural lean period in Nepal. 209 Village Development Committees (VDCs) across Nepal are reported to be moderately food insecure (Phase II) - a stressed situation where most of the households have minimal access to, or availability of food. This issue covers the period between July to September 2012. The period is characterized as an agricultural lean season during the monsoon (July-August), as well as the summer crop harvesting season from September onwards. The food security situation typically deteriorates during the lean season, and improve gradually with the incoming summer crop harvest. This issue covers the period January to March 2012, and focuses on the food security updates of the Mid and the Far Western Hill and Mountain (MFWHM) districts. January-March is an agricultural lean period in Nepal. This issue mostly covers the period of October-December 2011, the harvesting season of the main summer crops of paddy, maize and millet. The overall food security situation is reportedly good across the country, considered to be one of the best seasons since mid-2006 when the IPCbased Food Security Phase Classification was first introduced. This issue covers the period July-September 2011 and focuses on the food security updates of the Mid and the Far Western Hill and Mountain (MFWHM) districts. July – August is an agricultural lean period in Nepal and typically a season of increased food insecurity. This issue covers the period April-June 2011, the harvesting/postharvest season of main winter crops of wheat and barley. 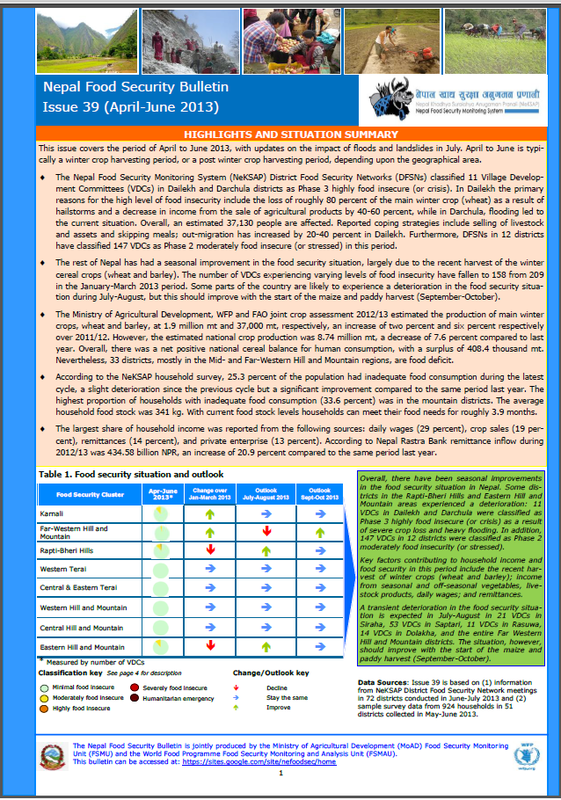 The overall food security situation has remained stable across Nepal. This is mainly attributed to a good harvest of winter crops (April-June) and employment pportunities generated by development aid. 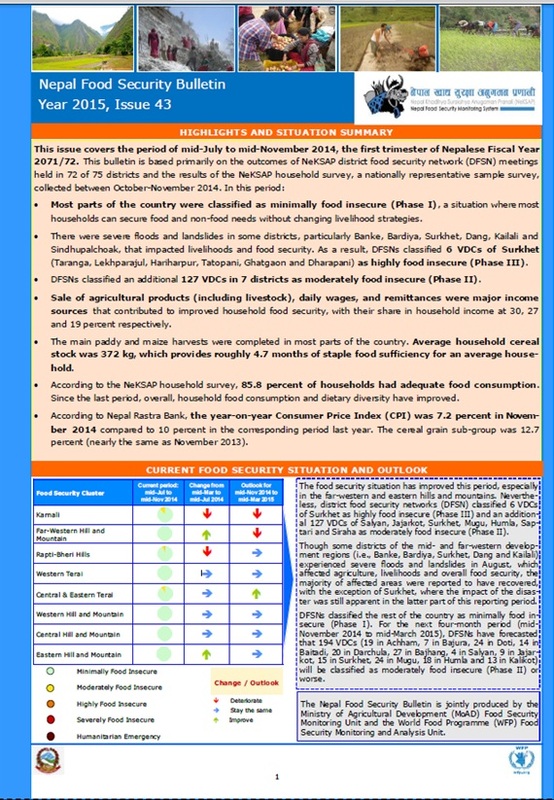 Between January and March, the food security situation across most of Nepal remained stable due to a good summer crop harvest that took place mostly in October-December 2010. However, in some localized areas where the summer crop was impaired, the situation has deteriorated. Far Western Hill and Mountain districts were particularly affected by crop losses and multiple districts are experiencing a high level of food insecurity. This issue covers the period October-December 2010, the harvesting season of main summer crops paddy, maize and millet. 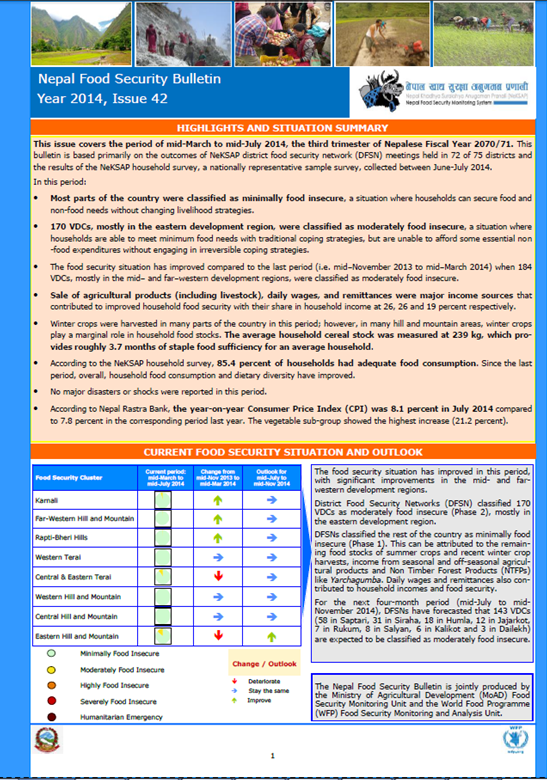 The overall food security situation is reported to be stable across Nepal. Most of the Eastern, Central, and Western Hill and Mountain regions as well as the whole Terai belt are generally food secure. This Food Security Bulletin covers the period July-September and is focused on the Mid and Far Western Hill and Mountain (MFWHM) region (typically the most food insecure region of the country). July – August is an agricultural lean period in Nepal and typically a season of increased food insecurity. The food security situation in the Mid and Far Western Hill and Mountain (M&FWHM) districts remains of major concern: winter crop production of wheat and barley were severely affected by localized natural disasters during the pre-harvesting period in late March-April. Production losses of above 50 percent were reported in the following districts: Bajura, Achham, Humla, Mugu, and Kalikot (drought); Rukum (heavy snowfall) and Dailekh (hailstorm). As expected, between January and March the food security situation deteriorated in parts of the Mid- and Far-Western Hill and Mountain districts. This is primarily attributed to the poor summer crop production in November/December 2009. In highly and severely food insecure areas, households have depleted their food stocks and basic food prices have increased by 20 percent or more compared to the same time last year. The recent completion of the major harvest period of the year has improved the overall short-term food security situation across the country. At a national level WFP household surveys revealed that food stocks and consumption levels have seen an improvement since late last year when the harvest begun. The total number of food insecure people across Nepal is estimated to be 3.7 million, this represents approximately 16.4% of the rural population. WFP Nepal is feeding 1.6 million people which has had a significant impact on reducing this figure. The current food security situation is worrisome and has deteriorated significantly compared to the same period last year. Despite significant food assistance to the Karnali region, most of the districts in the Karnali and Far West are currently classified as highly food insecure. Because of severe winter drought, 700,000 people in the Mid- and Far-Western Hills and Mountains are in need of immediate food assistance in addition to nearly one million people who are currently supported by WFP. The drought resulted in decreased national crop production for wheat and barley of 14.5% and 17.3% respectively; however, crop losses in many Hill and Mountain districts of the Mid- and the Far-West regions were more than 50%. Over 26,000 people are highly food insecure in Dolpa, Jumla and Mugu where cases of acute child malnutrition have been reported. Several areas of the Hills and Mountains of the Mid/Far-West are highly or moderately food insecure due to remoteness and marginal agricultural land, poor to moderate summer crops production (making people more dependent on purchased food), high food prices and limited income opportunities. Over the period July to September 2008, the number of people highly and severely food insecure increased by about 50% compared to the previous quarter due to severe flooding in the East and Western Terai districts, roads obstruction because of incessant rainfall and landslides, rise in food prices and decreased production of maize and other local crops. Over the period May – July 2008, the number of people highly and/or severely food insecure has increased due to poor winter harvests in parts of the Far- and Mid-west, rise in food prices and transportation costs, market closures due to syndicate strikes and inaccessibility of areas due to monsoon weather conditions. The past couple of months werecharacterized by ongoing bandhs in the Terai, resulting in shortages of fuel and other essential items and rising food prices across Nepal. Price rises in coarse rice were further exacerbated by the ongoing ban on export of nonbasmati rice from India and the global cereal price hikes (see WFP Market Watch No. 3). The monsoon created havoc in many of the Terai districts and caused landslides in numerous Hill and Mountain areas, severely impacting the food security status of poor households, many of whom lost their houses, food stocks, and assets. The monsoon rainfall had an overall positive affect on the food security situation due to good cropping conditions in most areas of the country. 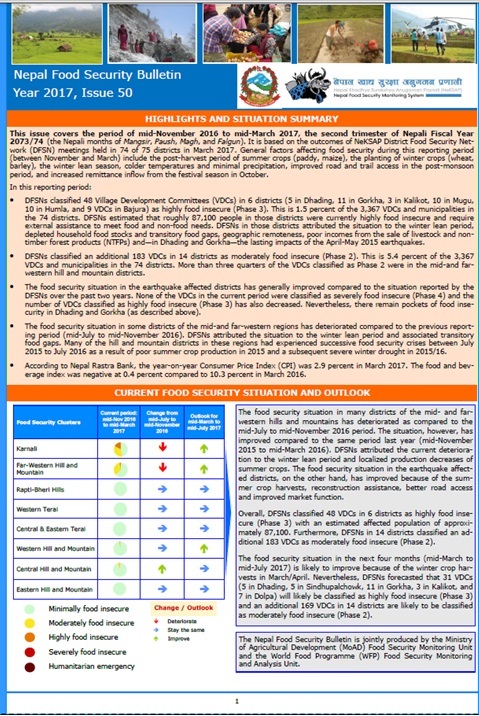 This issue of WFP’s food security bulletin provides an update of the current food security situation in 36 districts of Nepal covered under the surveillance activity of the Food Security Monitoring and Analysis System. As expected, the food security situation during the months of March—April has improved compared to January—February as the lean period comes to an end and most of the winter crops have been harvested. The ongoing drought and adverse weather conditions continue to affect the food security situation across the country. In its latest crop and food security assessment report, the Ministry of Agriculture and Cooperatives estimates a food grain shortage of almost 190,000 Mt for the year 2006/2007. In the past 4 years, WFP has implemented the field surveillance project funded by DFID with the aim to providing field based information regarding household food security across 32 districts of Nepal. The surveillance system is currently being strengthened to include macro, micro and sectoral level analysis; baseline surveys and assessments; and the monitoring of food security, crop, nutrition and market conditions. This May-June monitoring cycle marks late harvesting of wheat, barley and potato, and planting of paddy, maize, and millet. Reports from survey districts confirm the early assessments reporte in Bulletin 13; wheat and barley harvests are significantly lower than last year due to the winter drought, particularly in areas without irrigation facilities. People in the hills and mountains of Mid and Far-Western regions are worst affected with crop losses from 20 – 100%. This monitoring cycle marks the harvesting season of wheat, barely and potato. As anticipated in Bulletin 12, there has been a decrease in wheat and barley production this year, particularly in areas without irrigation facilities. Inadequate rain and snowfall during the planting and growth stages, in addition to localized hailstorms in some areas, have contributed to 20-100% crop losses. 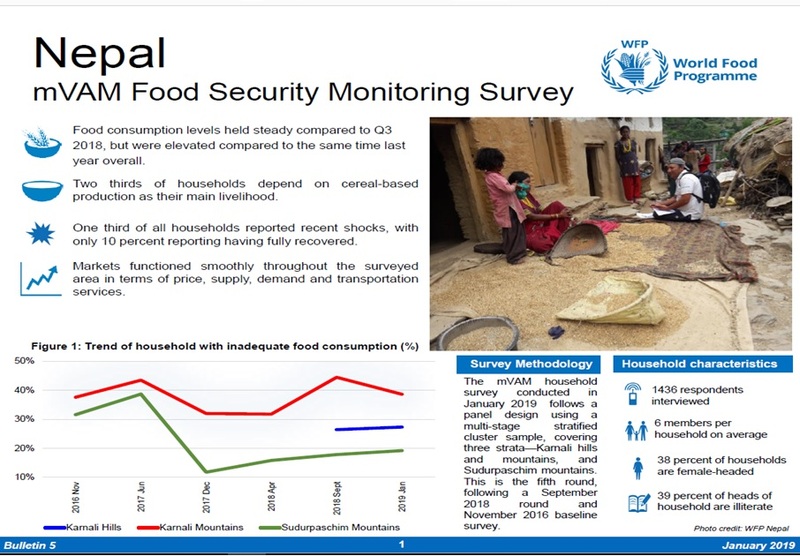 This monitoring cycle is the traditional lean season in agricultural Nepal, with participants to the WFP/VAM survey reporting limited food stocks (ranging from 2 weeks to 2 months) and an increase in their engagement in alternative livelihood sources. As before, a range of livelihood strategies have been reported, including wage labour, the sale of fuel wood, bamboo crafts and milk, the collection of forest products, and road construction. This monitoring cycle marks the primary harvesting season for paddy and maize. With some exceptions, survey participants report either no change or decreases in production due to the late monsoon earlier this year. The data indicates that the consequently delayed planting of these two major cereals contributed to lower food stocks and fewer agricultural labor opportunities in cases where less land was cultivated in the absence of sufficient irrigation. This monitoring cycle marks the late harvesting season of the main crops of wheat, barley, and potato as well as planting season of paddy and millet (refer also to Seasonal Calendar on p. 11). In most of the monitored districts, yields of harvested crops are higher than last year. This monitoring cycle marks the harvesting season of wheat, barley and potato. In most districts covered, yields are up over last year; and in several districts last year’s yields were high to begin with. As a result, food stocks in many respondents’ households currently exceed expectations. Moreover, retail prices of basic food items are down in most road head or district headquarter markets compared to the last cycle. This monitoring cycle is the traditional lean season in agricultural Nepal, and the participants in the WFP/VAM repeat survey deal with their low or exhausted food stocks through a range of livelihood strategies, from basket weaving to timber smuggling, as they have done before. This cycle’s data shows no indications of extraordinary stress or coping strategies. This monitoring cycle is the end of the major cereal harvests in Nepal, and the participants in the WFP/VAM repeat survey assess their current food stock to be greater than last year at this time. Only the flood-affected districts in the Central and Eastern Regions provide downbeat yield predictions and that has little effect on survey households because these tend to be landless and hence rely on wage laborincome rather than own production. This monitoring cycle is the period of major cereal harvest in Nepal, traditionally the season of plenty. Eight districts have seen a reduction of perhaps 10-20% in paddy yields, year-on-year, due to hailstones, monsoon delays, and collateral damage of the flooding earlier this year. Two districts have seen a reduction in maize yields, one insignificant, the other perhaps as much as 50 percent. The remaining 22 districts covered by WFP/VAM’s Food Security Monitoring have enjoyed normal or augmented cereal yields. In the areas surveyed, the winter harvest of wheat has been less than last year. The data of this reporting cycle shows a hike in wheat prices and lower-than-last-year food stocks. This confirms last bulletin’s prediction of lesser yield. So far, vulnerable populations do not appear to have resorted to negative or irreversible coping mechanisms on a noticeable scale, though. 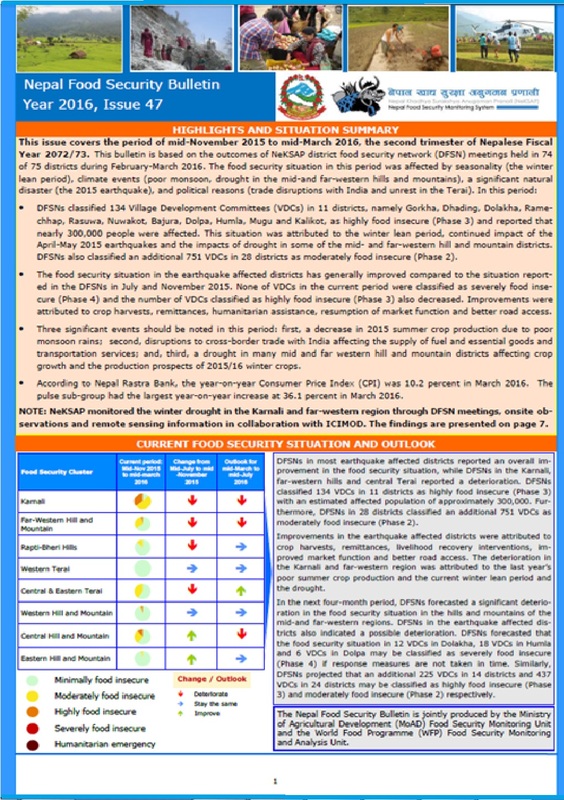 This bulletin reviews general food security related issues in the current context of Nepal in the 32 WFP programme districts from mid March to mid May, 2004. Observations are based on quantitative and qualitative field data, and anecdotal information, systematicallycollected since the end of 2002. 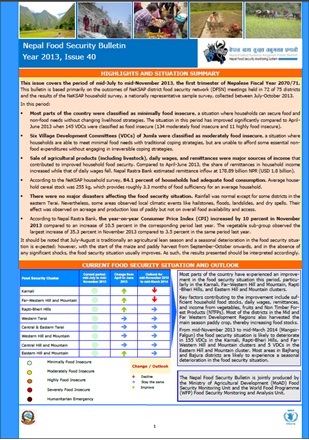 This bulletin reviews general food security related issues in the current context of Nepal in WFP programme districts from January to mid March, 2004.Observations are based on field data, quantifiable indicators, and anecdotal information systematically collected by WFP field monitors since the end of 2002. 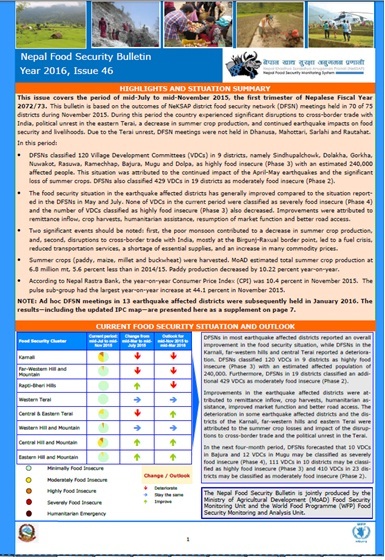 WFP Nepal will produce these bulletins in place of the previous quarterly field surveillance reports. The bulletins will provide regular updates on key issues relating to the situation of general food security in Nepal and more specifically for those populations who may be at increased risk due to their vulnerability and the impact of the conflict.